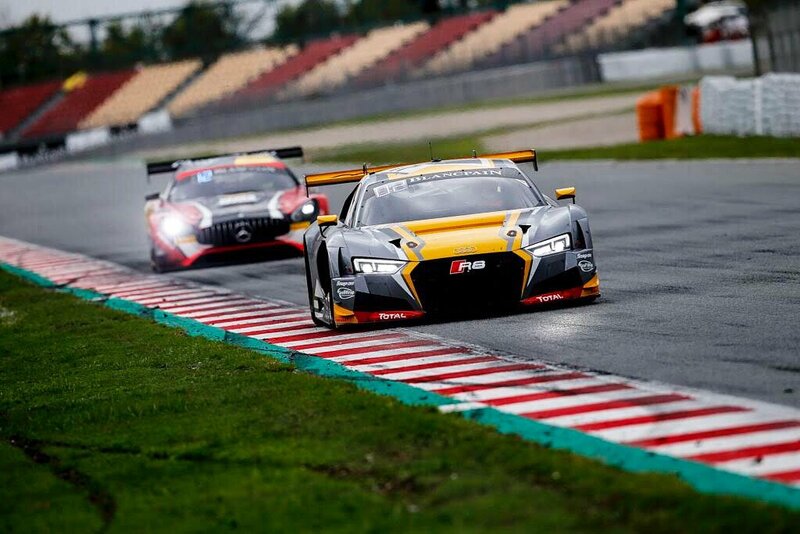 Jake Dennis will start the final race of his maiden Blancpain GT Series Endurance Cup season from pole position after team-mate Robin Frijns vaulted to top spot in mixed conditions at the Circuit de Catalunya in Barcelona. The session, which is split into three sessions so that each of the respective drivers can set a qualifying time, was begun in damp and greasy track conditions under dark, cloudy skies. While some teams opted to fit wet tyres to their cars for the start of the session, others selected slick rubber. But shortly after the start of the session, the slick-shod #7 M-Sport Bentley Continental GT3 machine of Guy Smith spun and collided with the pit wall prompting a red flag. On the restart, with drops of rain falling, Dennis’ third team-mate Stuart Leonard headed out in the #17 Team WRT Audi R8 LMS setting a sub-two-minute time of 1m 59.866s. Leonard handed the car over to Racing Steps Foundation-backed Dennis for the second qualifying session, with the track progressively drying and lap times reducing. With enough fuel for only a single flying lap, Dennis set a time of 1m 53.783s to maintain the car’s top five position. Despite a small mistake at Turn 5 on the following lap, Dennis brought the car back to the pits for team-mate Robin Frijns to take the final stint. In further brighter, drier conditions, Frijns headed out on to the track with fresh tyres. His efforts were halted quickly though by a red flag with under 10 minutes remaining as the #17 Sainteloc Audi R8 LMS of Christopher Haas slid off the track into the gravel on the exit of Turn 2, and the #14 Emil Frey Jaguar stopped off the track. On the restart, Frijns vaulted to the top of the times with his first flying lap setting a time of 1m 46.019s. That time was not threatened as tyres faded in the final minutes. Fellow RSF-backed driver Ben Barnicoat also completed the session in the #42 Strakka Racing McLaren 650 S GT3. Barnicoat was handed the responsibility of completing the third qualifying stint with the car’s best time of 2m 01.929s being set by team-mate Sam Tordoff in the first session. With the car provisionally sitting in 45th overall position, Barnicoat managed to take advantage of the far drier conditions in the final stages to set a time of 1m 48.085s on his second flying lap to finish the session in 33rd position on the grid. The #17 Team WRT Audi R8 LMS will line up on pole position alongside the #63 Grasser Racing Lamborghini Huracan GT3 shared by Andrea Caldarelli, Christian Engelhart and Mirko Bortolotti.